LONG STORY SHORT: Nate got a photography gig from a company taking their top sales reps to Costa Rica. Since my Dad is from there and since its the most beautiful place on earth, we quickly worked a plane ticket for me into our budget. I joined Nate in the very Northwestern corner of the country, near the Nicaraguan border [the Golf of Papagayo in the Region of Guanacaste] on the most beautiful resort I have ever been to with the best service I have ever received; there were about 3-4 employees per guest. The sitcom ‘Cheers’ comes to mind, because EVERYONE knew our names and our ‘drink’ of choice: virgin pina coladas or fruit smoothies of mango and passionfruit. We had a beautiful room with a balcony looking over the ocean; monkies, parrots, iguanas and geckos were everywhere. 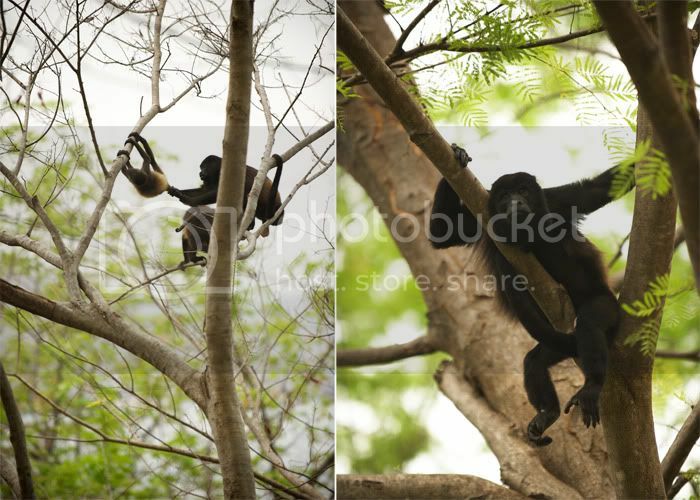 Here are some howler monkies that we saw close to our room; that little one was harrasing the adults and didn’t get away quick enough. Their howls were scary at night, sounding like a cross between a dragon roar and a wolf howl. The ocean water was so warm and clean. We swam every day, obviously. There were hermit crabs EVERYWHERE, sometimes it looked like the entire beach was shifting and moving!! You couldn’t take a step without squishing a few into the sand. Nate could attest to how much I loved them; they made me squeal and giggle like a little girl. Nate’s employer was incredibly welcoming and warm to me… they even included Nate on their deep-sea fishing trip [where he caught a huge red snapper, which they cooked and served to us as fish tacos and ceviche]. They included me in their day at the spa with a 75 min facial [I'd NEVER had one! 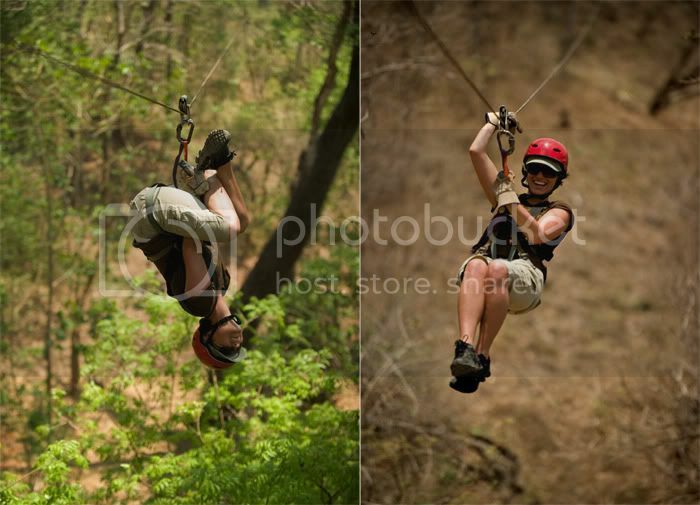 ], and they brought BOTH of us on their zipline tour. On the ropes, we got up to speeds of 45 mph. The workers there even taught me how to go upside down!! That night before, after ‘hot-tubbing’ in the jungle, we headed back to the little bungalow where we were staying, showered up, and decided to get some dinner. Walking down a path to a nearby restaurant, Nate saw lava!!!! We set up Nate’s tripod and ordered our food, and enjoy the sights from the patio. Early the next morning we headed out, and while driving through some beautiful farmland, we saw someone taking a picture over the side of the bridge. We decided to follow suit and low and behold…. These bridges didn’t make us feel any better. The next morning we went for a hike up a nearby river and spotted these bespectacled owls. Ever the inquisitive child, Nate decided he wanted to wake them up, and so after throwing a few rocks at them, I decided to hike up the hill and wiggle the tree next to them. They awoke and spun their heads around a few times and then flew away. On my way back down, I started slipping down the hill and all these leaves collected around my feet and all of a sudden, I felt this bite on my ankle!!! Inside, I freaked out… on the outside, I said: ‘Ouch.” We took a look at my ankle, and there were two puncture wounds about 1/2″ apart. Swelling soon followed…. again, LONG STORY SHORT, I’m fine!! Nate found this poison dart frog… we found out later that if the poison secreted by this animal got into either your eyes or your mouth, you would die within 2-4 hours. Ahhh!! This butterfly was our good luck charm! She was BRIGHT blue on the inside and followed us nearly the whole way. This tapier let us get SO CLOSE!! We could have followed him all day long! We had to pick up our luggage, get it to the donkey cart, hike another mile, and then drive our car 2 hours to get to the nearest civilization to get a hotel. VERY quickly we were walking through torrential rainfall and lightning on the beach [NOT a good idea]. When we got our car, we ran into some guys who were heading in the same direction we were, and we ALL started booking it. We didn’t get far before the road became impassable with SUPER flooded rivers and enormous trees knocked down into the road. To say the least, it was a very crazy night. We had some people come and cut trees apart with machetes, and we watched as a friend of ours was nearly carried away down a flooded river before his tires caught. After watching THAT, we decided we weren’t going to cross, but we decided we couldn’t stay where we were either. A Costa Rican boy offered to drive our car across the river and we accepted for lack of better options. He started edging into the water and RIGHT when we reach the middle, WE SINK and suddenly the headlights are under water and water is coming up over our hood!!! I was screaming, but the kid gunned it and got us out of the river fast. Despite the danger, we slept in the car that night… IN the jungle since later on all the rivers were just too deep to pass. Shown below are two of the guys that took care of us that night. After getting stuck in mud pits, fording rivers, sharing limited food and moving tree, after tree, after tree out of the road, we felt like these guys were family. … and this was mine! They couldn’t get over how tall he was!! This was the opportunity of a life time, and I was SO happy to share it with Nate. I am so proud of him and grateful for him. What an amazing adventure. Granizado- a special dessert found mostly in Puntarenas made of shaved ice, cherry syrup, vanilla ice cream, powdered milk and sweetened condensed milk! Salsa Lizano- Native to Costa Rica, this sauce is spicy and sort of sweet. LOVE IT! 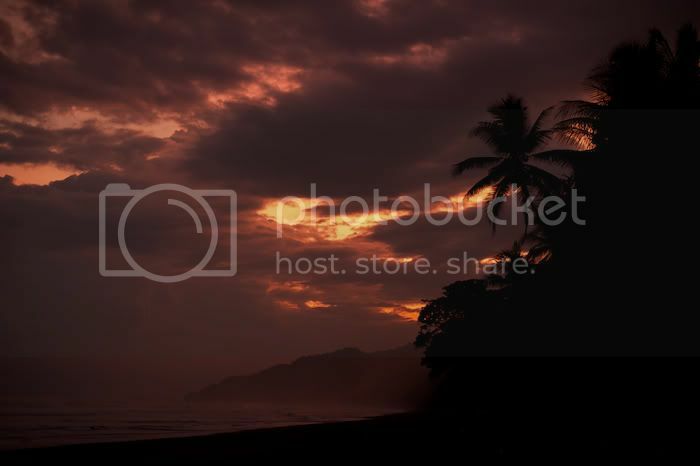 Pura Vida- A common phrase that Ticos use for nearly everything! How’s it going? = Pura Vida? … It’s going great! = Pura Vida! … Have a great day! = Pura Vida! The Perkes Family - Very cool you guys! Nate the photos are awesome, love the one with the boat, and the sun peaking through the trees. Glad your home safe, sounds like more adventures are to come, can't wait to see whats next in store. LOVES!